Search for Art Bench events on St. Croix Splash, the regional arts, culture, and nature events calendar powered by ArtReach St. Croix. Explore science through creativity with a national park ranger and take home a project about what you discover. Sat., June 2, 10:00 a.m. – 1:00 p.m. Mon., June 11, 10:00 – 11:30 a.m.
Wed., June 13, 2:00 – 3:30 p.m. Mon., June 18, 10:00 – 11:30 a.m. Mon., June 25, 10:00 – 11:30 a.m.
Wed., July 11, 11:00 a.m. – 12:30 p.m.
Tues., July 17, 11:00 a.m. – 2:00 p.m. Sat., July 21, 2:00 – 5:00 p.m.
Fri., August 24, 1:00 – 4:00 p.m. Sat., October 13, 12 noon – 2:00 p.m.
Pop-Up Art + Nature projects were developed in partnership with Belwin Conservancy, Afton, Minn., to engage and connect communities with the natural world. Books & Benches is a project of the Somerset Elementary Family Book Drive in partnership with The Phipps, local libraries, and the National Park Service to sustain summer reading and expose young readers to community art in the St. Croix River Valley. 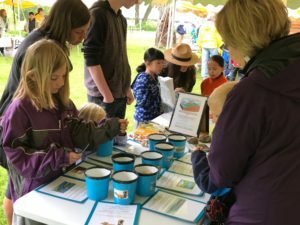 This program received funding from St. Croix Master Watershed Stewards/Tropical Wings in celebration of the 50th Anniversary of the Wild & Scenic Rivers Act.